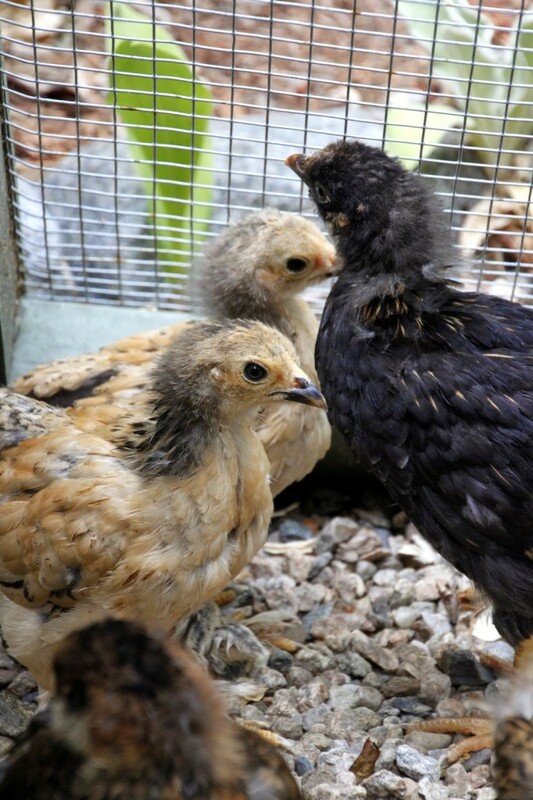 These past few days, I have noticed that our 3 week old chicks seemed to be getting a bit ancy in their brooder. 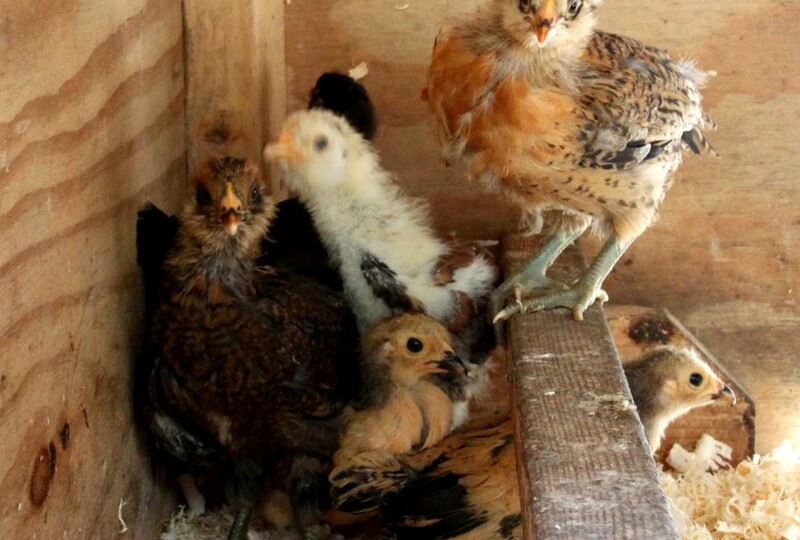 Despite the roost, chicken toys, cardboard paper towel rolls, and the mirror, they needed to stretch their wings. Today was just perfect. The thermometer hit 80 degrees. It was certainly warm enough. So I let them explore the small chicken coop sitting at the top of the driveway. Inside the coop I added a fresh layer of pine shavings, their waterer, feeder, and the Ecoglow 20 brooder. 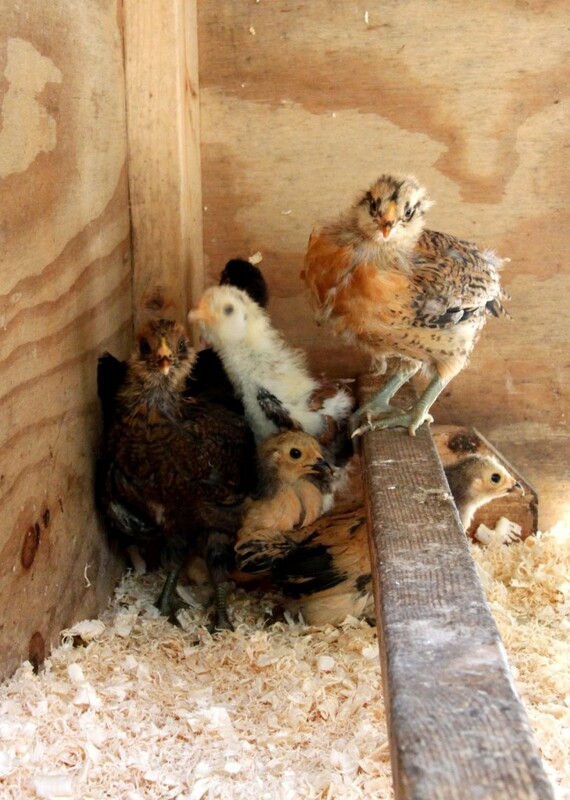 Then one by one I carried them out to the coop. At first, they hid in the far corner, terrified of their new surroundings. Then after about 10 minutes or so, they began to explore. First thing was to try out the roost! One by one they took turns jumping on and jumping off. Then a couple of them got a little more bold. They dared to peek outside! The sun was bright and the mini-run was waiting to be explored. Today the kids had a half day of school and it was time to go and pick them up. After grabbing a quick bite of food and ice cream to celebrate the last day of school, we arrived home to discover all six of the little cuties outside in the run. 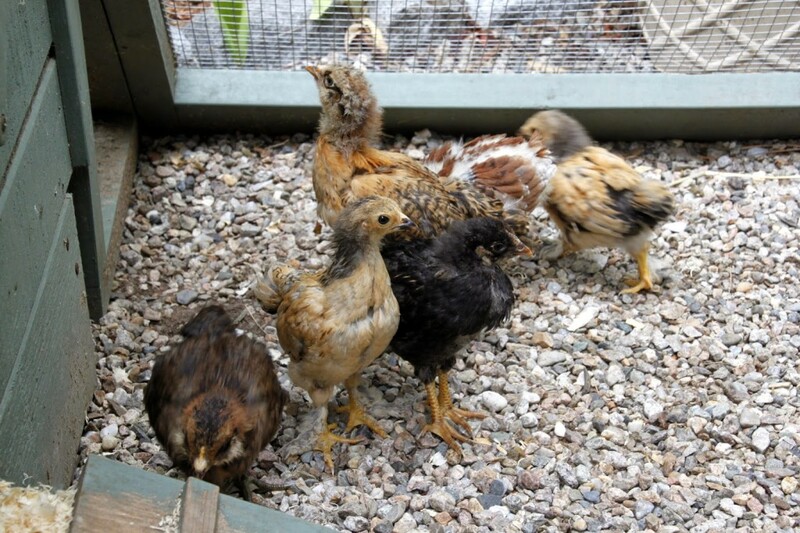 There they were exploring, scratching, discovering treasures, and acting like chickens. They are just getting into their awkward teenage chicken years. Their feathers are somewhere between fluff, quills, and feathers. Their legs are looking more prehistoric, decked out with scales. Their eyes are baby slate colored. Mini-combs are beginning to grow. The Easter Eggers’ heads are becoming more proportional with their bodies. They also happen to be the friendliest two personalities in the flock. They are not afraid of us at all. In fact, they seek out our attention when we are near them. We believe Cuddles is this flock’s head hen. 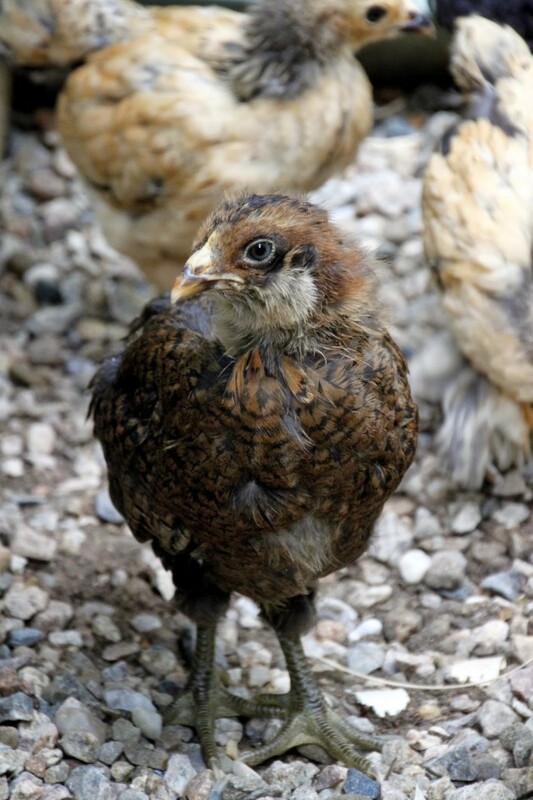 Even the Buff Brahma Bantams are really starting to look like their breed. We can tell them apart because Panko has a dark beak and Storey has a light colored one. 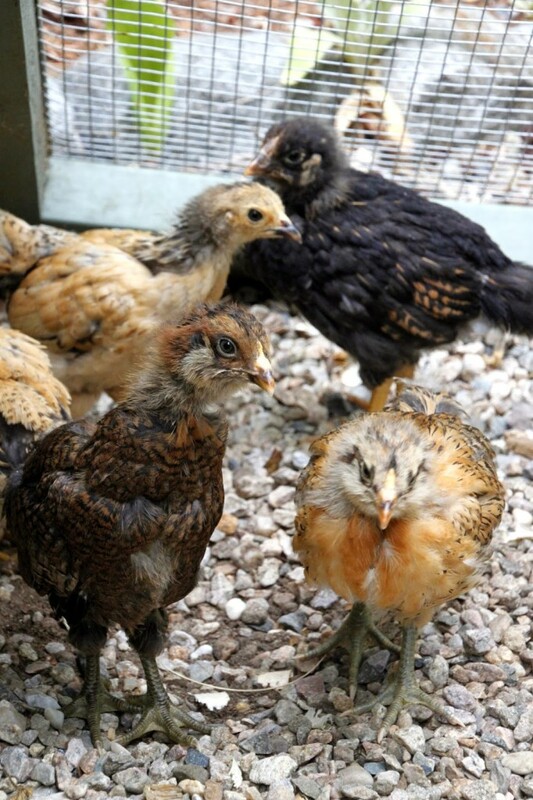 We find that looking for small differences, even in the shapes of their combs, toes, and beaks, can help to tell chickens of the same breeds apart. 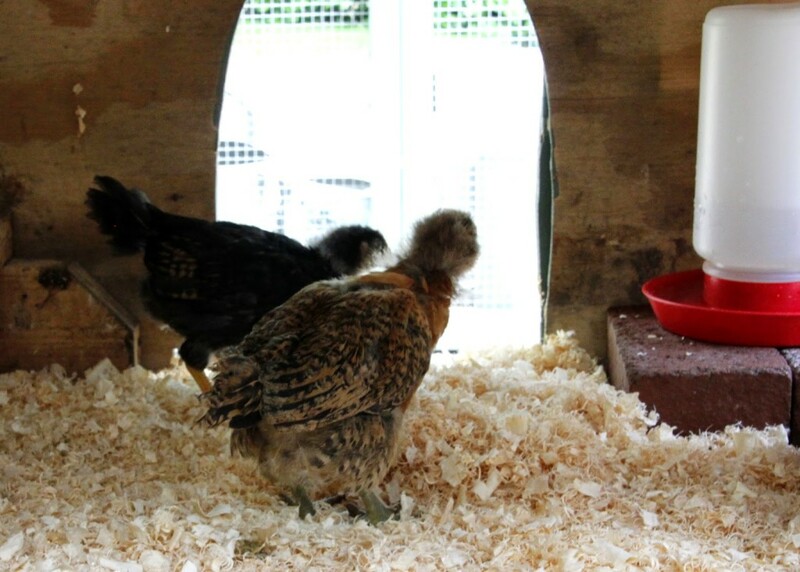 After three hours outside it was time to return the little ones back to the brooder. I’m sure they needed a nap. 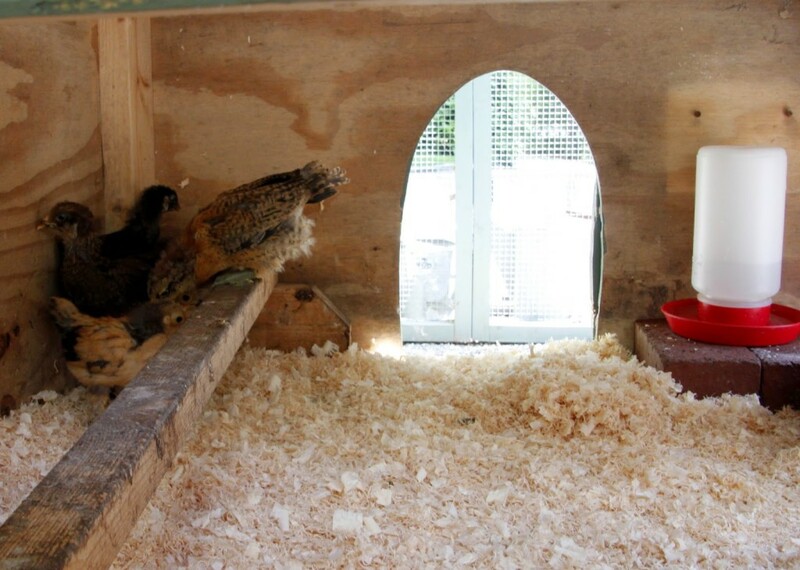 As I returned them to the brooder, they gobbled up their food and water as if they hadn’t eaten for days. Then Storey headed over and cuddled up with the chicken mirror. 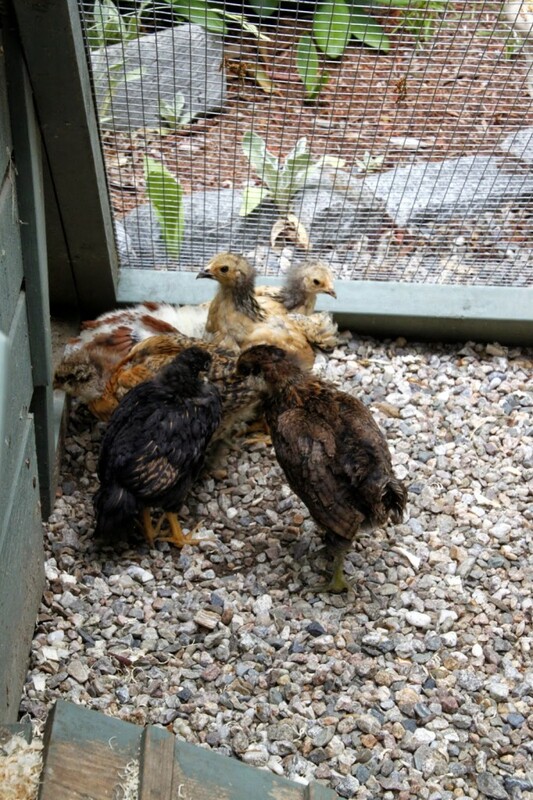 One by one, the others followed suit, until they were all nestled closely together making a quilt of chicks. I could hear sleepy trills of pure contentment coming from this pile of chicks. I can only imagine their dreams!